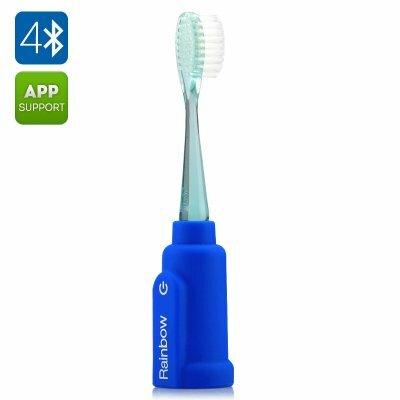 Successfully Added Rainbow Smart Toothbrush For Children - Bluetooth, iOS + Android App (Blue) to your Shopping Cart. This Rainbow smart toothbrush by Vigilant transmits brush motions to an interactive smartphone game that has been designed to educate children on proper brushing techniques. Kids will have fun while learning proper brushing techniques as well as improving oral hygiene and it encourages good habits. Connecting via Bluetooth, this toothbrush helps children learn the perfect brushing technique recommended by dentists. With its motion and 3D sensors, Rainbow is a manual toothbrush that tracks brush positions and movements inside the mouth while the app is calculating variance and guiding the brusher. Parents can now comfortably check kids' brushing habits on their Smartphone, and also know how well they are doing it. Many people spend vast sums of money at the dentists so this brush gives you a head start by not only getting your children to brush their teeth regularly, but also better. Introducing the Rainbow smart toothbrush that gamifies the brushing experience. You’ll be amazed at the results. This product is in stock now, we guarantee next working day shipping and offer a 12 months warranty on all our products. Brought to you by the leader in electronic devices and wholesale healthgadgets, Chinavasion. OS Support: Android and IOS.